Good morning anytime of the day! Yes, Karlo’s Gourmet and Coffee serves all day breakfast menu from 8:00 AM to 11:00 PM. Never miss out your breakfast. That is one thing that any individual should be accustomed of. Why? 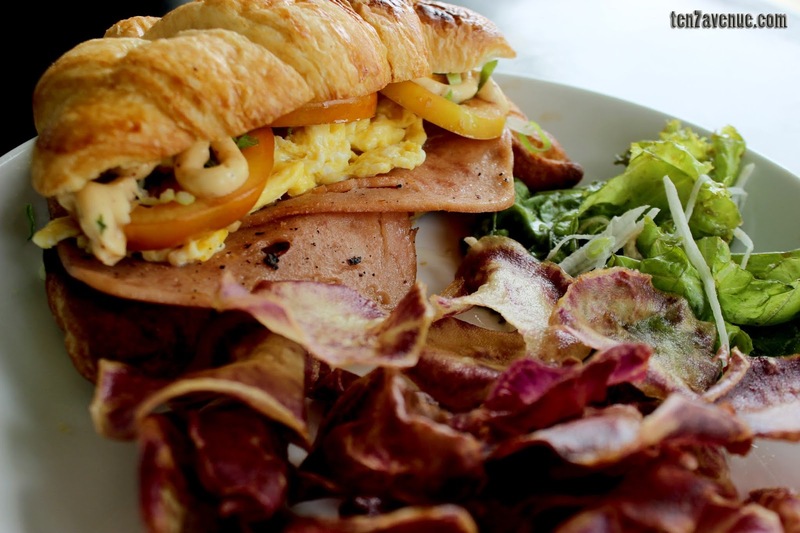 It is because your breakfast will give you much of the energy you’ll need for the day. 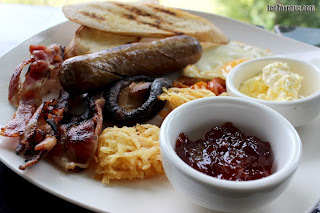 Also, your breakfast may not be very heavy but as long as it is healthy and balanced with enough carbohydrates, proteins and fats that’s good enough. What if you’re really into “brunch”? That’s not a problem! It is your preference but do not compromise meal and putting yourself hungry. What if it’s anytime of the day? That’s gonna be great! 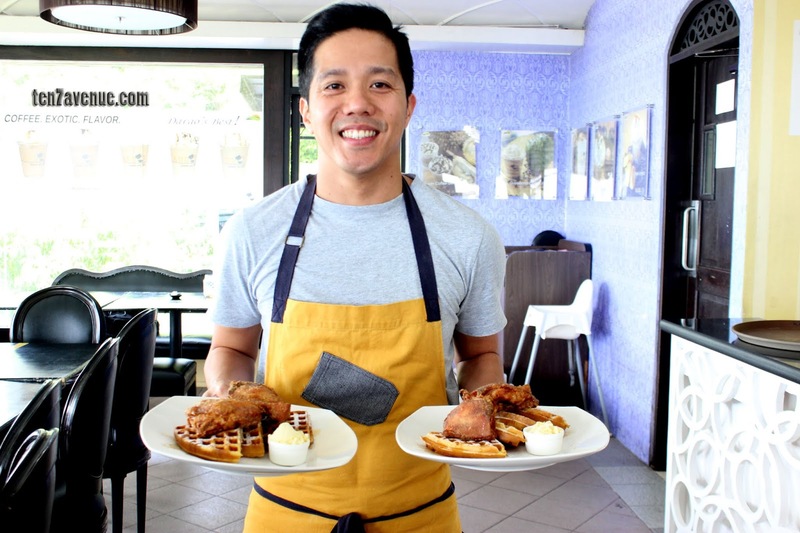 At Karlo’s Gourment and Coffee, Chef Karlo is the master of these all day breakfast menu. Yes, he has made it to perfection. A menu that you would want to taste from each dish. But, I will give you a hint of my TOP 5 favorites! 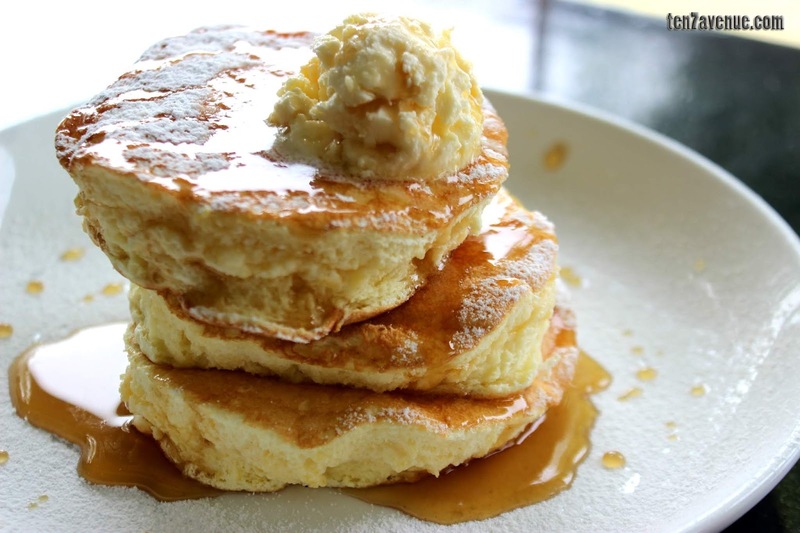 I really love these pancakes. Why? 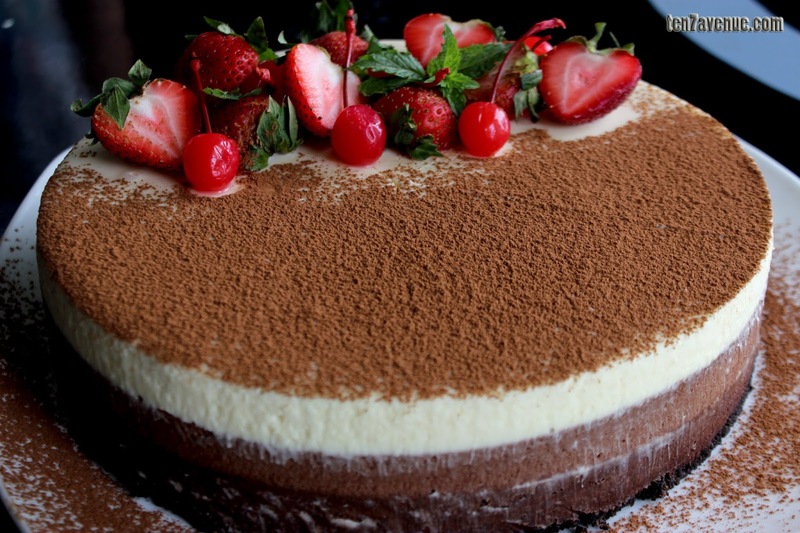 It is because of the fluffy and smooth texture that when you eat it, it melts in your mouth! How’s that? It doesn’t feel heavy and any guilt at all. Topped with maple syrup and butter made it with much perfection! Thanks, chef! Second, the SMOKED SALMON BAGEL SANDWICH! 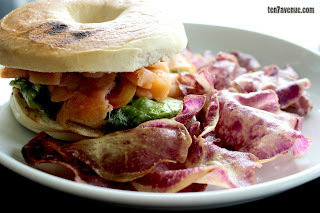 The smoked salmon is really perfect with the bagel sandwich. The sandwich also has creamcheese, tomatoes and green salad dressed with tasty balsamic vinaigrette. Crispy potatoes on the side are completing the carbohydrate need. Yum! 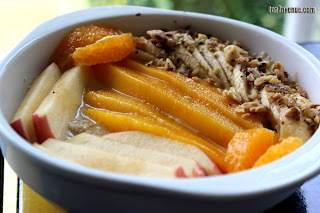 Third, the TROPICAL OVERNIGHT OATS! I am among those oat and fruit lovers there that will surely love this one! I really love this! The oats soaked in milk topped with very fresh fruits like sliced apples, mangoes, bananas and oranges made me very happy. This is perfect anytime of the day and served cold. Yum! Fourth, the CHICKEN AND WAFFLES! Do you know the feeling of smelling butter all around the corners when the dish is served? I am jumping in joy! 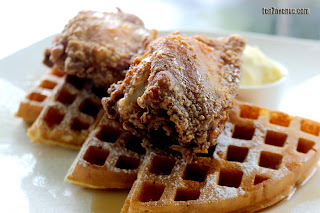 The chicken has perfect crisp and the waffles with butter are soft too! This is a complete meal for me. I love it! All the components of this dish compliment. 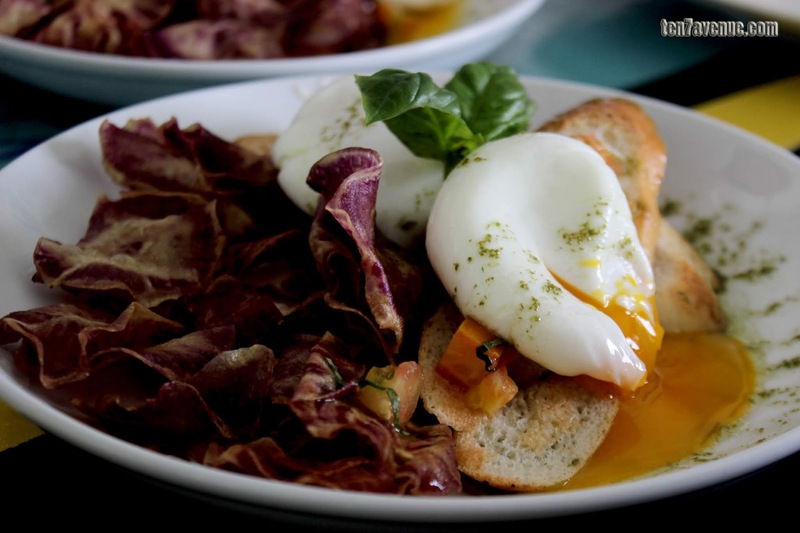 The star of this dish are the poached eggs that drip on the toasted bread rubbed with cream cheese. It is flavorful plus it is drizzled with pesto sauce and crispy potatoes on the side. Upon eating, all flavors play well in my mouth and my mood is pretty happy. That will make your all day breakfast experience alight! If you happen to notice, I am extremely happy having breakfast without rice. Well, I am used to eating breakfast without it. Breads, oats or fruits are good for me. 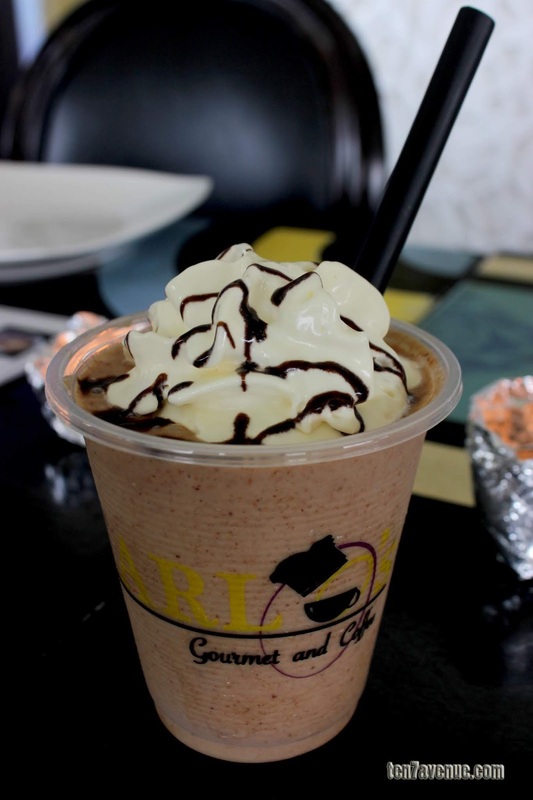 On the other hand, there are more with the all day breakfast menu of Karlo’s Gourmet and Coffee. There’s the bacon strips with egg (many loves it! ), hash brown, sauteed shetaki mushroom, tomatoes, Italian sausage, and French toast bread. At the side are butter and strawberry jam which are perfect combination for the bread. It is also a complete, heavy meal. Burp! Excuse me. 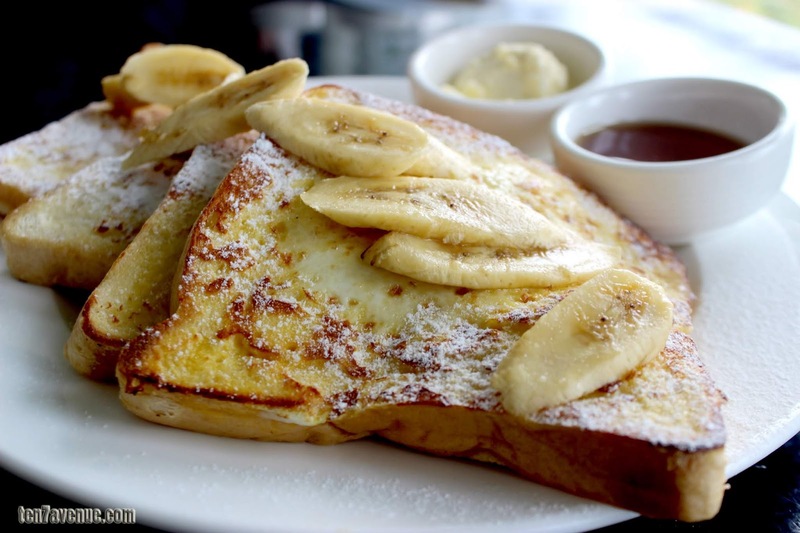 The French Toast with Bananas. I also love these. The french toast with bananas is a light meal but very tasty! The bread is soft and milky. Pour in the maple syrup or spread the butter, in any way, it is perfect! Plus munching in the sliced bananas makes me happy. It is a surprise for me. I love it, too! 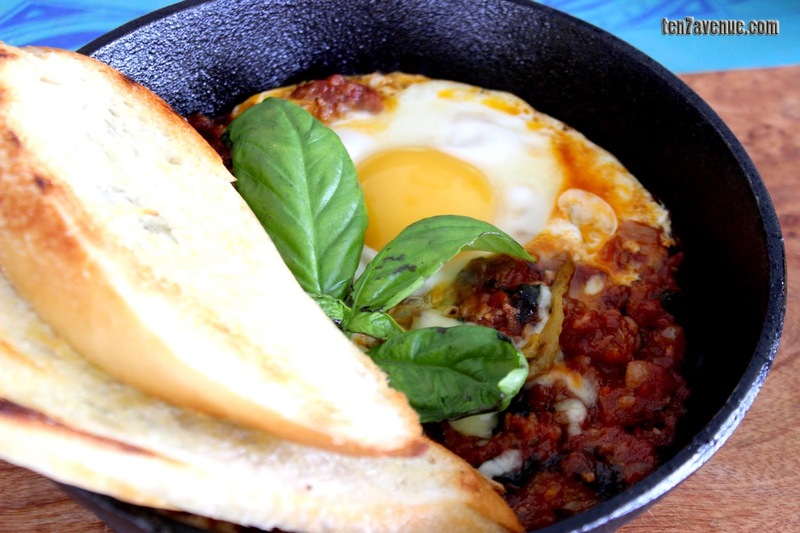 This traditional pork sausage (chorizo) is simmered with tomato sauce then topped with fresh eggs, roasted pimiento and mozarella cheese in a hot skillet. It smells and tastes very good. The crusty croissant is filled with ham, tomatoes, runny egg and special sauce. That’s gonna be a great morning dish! Then, there are crispy potatoes and green salad on the side. It’s a complete meal! 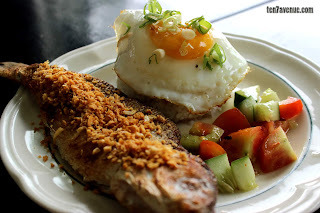 A very traditional Filipino breakfast, daing na bangus. This one has rice topped with egg! The milkfish or bangus is perfectly fried with garlic bits on top plus very healthy with a tomato and cucumber salad. You gonna love this for a fantastic morning breakfast! There are more surprises in the cafe. They have variety of exotic drinks such as the Mangosteen Kapeccino. Then, for those sweet tooth out there, this month of June, they will serve a very rich Triple Chocolate Mousse - I am drooling much with the cake - chocolate is life! Thank you Chef Karlo for that awesome experience at Karlo's Gourmet and Coffee with an awesome overlooking view of Davao City. Thank you also guys for visiting my avenue, www.ten7avenue.com.